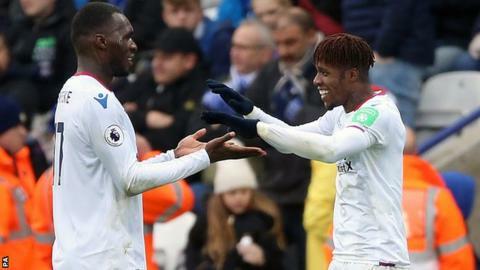 Crystal Palace boss Roy Hodgson said Christian Benteke delivered on a pledge to make amends for his penalty miss last weekend as the Eagles climbed out of the Premier League relegation zone with a rare away win over Claude Puel's resurgent Leicester. Benteke cost Palace victory over Bournemouth when the injury-time spot-kick he was not supposed to take was saved, but the striker redeemed himself by opening the scoring against the Foxes with a first-half header from Andros Townsend's cross - his first goal of the campaign. Hodgson said Benteke "held his hands up" in training after last week's match and had promised to "make things up" to his team-mates. "That's exactly what he has done," Hodgson added. "He's a quality striker and it wasn't just his goal that pleased me about his performance." Palace had failed to score in their past 10 league away games but added a second goal of an organised and adventurous performance before the break when Benteke's strong run and pass set up Wilfried Zaha for a brilliant individual finish. Leicester only tested goalkeeper Julian Speroni when they rallied in the second half - the Argentine reacting superbly to reach Riyad Mahrez's angled low drive with a strong palm. And any potential comeback was hamstrung when Wilfred Ndidi was sent off on his birthday less than a minute after Vicente Iborra's header was correctly disallowed for a foul. Ndidi - who turns 21 today - was shown a second yellow card for simulation in the penalty box with just under half an hour to play. Palace had a much more legitimate penalty shout when Benteke was crumpled in the area by Marc Albrighton's sliding tackle from behind, but the referee waved away appeals for a chance to add extra gloss on an impressive away display. Bakary Sako eventually provided it - tucking away Ruben Loftus-Cheek's pass across goal to round off a 94th-minute counter-attack. The Foxes, who so impressively dismantled Puel's former club Southampton in midweek, remain eighth in the table, while Palace rise four places to 14th. Palace had taken 90 shots over 10 games without finding the net away from home in the league - their last away goals came in a 2-1 victory over Liverpool at Anfield under Sam Allardyce in April. It was the longest such run since 1949-50 - when Manchester City went 12 top-flight matches without scoring away - and was broken by Benteke, who himself had failed to score from 28 attempts in his past 13 matches. In truth, as 10-man Leicester poured forward in the game's closing stages, Palace - and Benteke in particular - could easily have scored more than three. Another Benteke header was kept out by an acrobatic Kasper Schmeichel star-jump save at the far post, and the Belgium striker also saw a shot diverted just wide by Wes Morgan's last-ditch block. But in the end, it didn't even matter that Townsend shot horribly over the bar after another late counter. Hodgson took over with Palace without a goal or a point from their opening five league matches, but his side are now eight games unbeaten having not lost since a 1-0 defeat at Tottenham on 5 November. It is their best run in the English top flight since a series of 12 games without defeat was ended in October 1990. Only Manchester City and Burnley had won more points than Leicester's tally of 17 from Puel's first eight matches in charge - and the Foxes went into his ninth game having won each of their past four. But while Palace looked dangerous every time they went forward - Zaha, Townsend, Loftus-Cheek and Yohan Cabaye all conspiring around target man Benteke - Leicester were easily snuffed out by the away side's aggressive defence. The isolated Jamie Vardy was far from his waspish best, while Mahrez - a spectator in the first half - lost the ball in midfield five minutes before half-time to spark the move with which Palace doubled their lead. Zaha, who had already threatened with several promising runs, expertly took Benteke's pass in his stride, regained his balance, slid past the covering Ben Chilwell with a stepover and fired the ball past Schmeichel. It was a brilliant goal, but few would have anticipated the gulf between Leicester's sluggish showing on Saturday and Wednesday's 4-1 victory at Southampton. Roy Hodgson has never lost a competitive match against Leicester as a manager (P5 W4 D1 L0). Ndidi became the fourth player to be sent off on his birthday in a Premier League game, after Dwight Gayle (17 October 2015 against West Ham), Gerry Taggart (18 October 1997 v West Ham) and Les Ferdinand (8 December 1993 against Liverpool). Palace have kept three straight away clean sheets in the Premier League for the first time. Since making his Premier League debut in September 2012, Benteke has scored 24 headed goals - only Arsenal striker Olivier Giroud (27) has netted more in the competition in this period. Crystal Palace boss Roy Hodgson, speaking to BBC Sport: "[Benteke] was very strong. The day after [Benteke's penalty miss] he came in and held his hand up, he spoke to the players and myself and made the point that he would make it up to team, and that is what he has done. "We did feel a bit marooned [at the bottom of the table], there was a time when we were looking up at everyone above us and the gap was massive. "But since then we have started playing the way we have over the past few games, and if we can produce performances like this all the way until May, at least we will have given ourselves a chance. "I can't say I'm surprised [by the win] - we've had good results away from home where a victory would not have been totally out of order. It's good to get it today because the longer that run goes on the more you keep getting reminded of it." Leicester manager Claude Puel, speaking to BBC Sport: "It was not a good day for us. We did not start well, we played without intensity. We played a good team with confidence - Palace deserved this win, they played very well. "We needed to be more aggressive. We needed more good play, more intensity and quality. "We tried to react in the second half. Ndidi was sent off and after we tried but it was too difficult for us to come back in this condition and we conceded a third goal, which was a little harsh for us. "For us, it is a good lesson for the future. Now it is time to look forward." Leicester host Manchester City in the Carabao Cup quarter-finals on Tuesday (19:45 GMT kick-off), before a home Premier League game against Manchester United on 23 December (19:45). Crystal Palace's next match is away at Swansea in a 15:00 kick-off in the Premier League on Saturday. Match ends, Leicester City 0, Crystal Palace 3. Second Half ends, Leicester City 0, Crystal Palace 3. Goal! Leicester City 0, Crystal Palace 3. Bakary Sako (Crystal Palace) left footed shot from outside the box to the top left corner. Assisted by Ruben Loftus-Cheek following a fast break. Attempt blocked. Demarai Gray (Leicester City) right footed shot from the left side of the box is blocked. Assisted by Riyad Mahrez. Substitution, Crystal Palace. Bakary Sako replaces Christian Benteke. Foul by Ruben Loftus-Cheek (Crystal Palace). Danny Simpson (Leicester City) is shown the yellow card. Corner, Crystal Palace. Conceded by Leonardo Ulloa. Substitution, Leicester City. Leonardo Ulloa replaces Jamie Vardy. Substitution, Crystal Palace. Jairo Riedewald replaces Yohan Cabaye. Corner, Crystal Palace. Conceded by Wes Morgan. Attempt blocked. Christian Benteke (Crystal Palace) right footed shot from the centre of the box is blocked. Assisted by Wilfried Zaha. Attempt missed. Andros Townsend (Crystal Palace) left footed shot from the left side of the box is too high. Assisted by Ruben Loftus-Cheek. Corner, Leicester City. Conceded by Scott Dann. Attempt blocked. Andy King (Leicester City) header from the centre of the box is blocked. Assisted by Demarai Gray with a cross. Corner, Crystal Palace. Conceded by Kasper Schmeichel. Attempt saved. Christian Benteke (Crystal Palace) header from the left side of the six yard box is saved in the bottom left corner. Assisted by Andros Townsend with a cross. Attempt missed. Wes Morgan (Leicester City) header from the centre of the box is high and wide to the right. Assisted by Demarai Gray with a cross following a corner. Corner, Leicester City. Conceded by Yohan Cabaye. Substitution, Leicester City. Andy King replaces Marc Albrighton. Substitution, Leicester City. Shinji Okazaki replaces Vicente Iborra. Attempt missed. Ben Chilwell (Leicester City) left footed shot from outside the box is high and wide to the left following a corner. Corner, Leicester City. Conceded by Jeffrey Schlupp. Foul by Riyad Mahrez (Leicester City). Attempt missed. Demarai Gray (Leicester City) right footed shot from outside the box is too high from a direct free kick. Jeffrey Schlupp (Crystal Palace) is shown the yellow card for a bad foul.